Once the children get settled in their career,parents are more worried about getting them married. Now a days getting married is not easy as it use to be. Previously though there was no Internet and no proper means of Media/Communication, Marriages were easy. But now a days it is becoming task of your life. Though thousands of profiles are available on different websites,getting a perfect match is not easy. Is it possible to know about your life partner from your horoscope ? Can you know about his nature ? Will he be from other caste or different religion ? Does horoscope tell about your married life ? Will it be good or there is divorced written in my destiny ? - All these questions could be answered by your Horoscope. 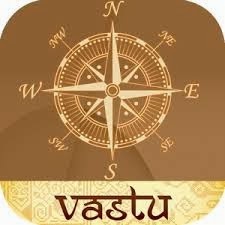 In horoscope there are 12 houses and each house represents different things and persons in your life. Very First house represents yourself. How you will be ? What will be your nature ? How will be your physique ? What is your thinking pattern ? From following picture,this concept will be more clear to you. The house in which number 1 is written represents yourself. That is first house. Second house tells about your financial status, about your family members. Third house describes about your travelling,about your strength. Fourth house tells about your your mother,your home. From Sixth house Astrologer can tell about your Job Profile etc. Our life Partner,our Business Partner stands exactly in front of us. Yes the house in which number 7 is written unfolds the story of our Married Life. It describes about your Partner. 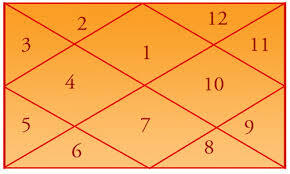 The Rashi,the Planets which is placed in seventh house gives idea about the Life Partner and Married Life. Seventh House connected with Sun - Partner will be Enthusiastic. He will be Ambitious. Nature wise person will be Adamant. He will be Dominating. He always likes to lead. Seventh House connected with Moon - Partner will be Emotional and Caring. In Astrology we say he will be like Motherly figure for family members and for society. He will keep doing things which will contribute in providing food to the people around. This person is fond of pets. He gets satisfaction in doing social work rather than wasting money on entertainment. Seventh House connected with Mars - Person will be Short Tempered. He will always keep himself in Competition with others. Likes speed and aggression in every aspect of life. To tune up with this person one needs to understand planet Mars first. 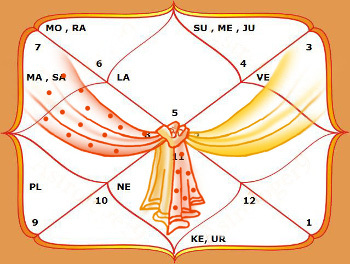 Seventh House connected with Mercury - If your life partner keeps the group alive and entertains in marriage ceremony,birthday parties, assume that you have Mercury connected to your seventh house. These kind of persons cannot stay in isolation. They like to travel and make new friends. Seventh House connected with Jupiter - Jupiter is huge planet. This partner is fond of accumulating knowledge from different aspects. He enjoys the company of wise people. He likes to visit religious places. Seventh House connected with Saturn - Partner will be least bothered with materialistic things. He will be more of an introvert.Roaming around and watching movies on holidays is not his cup of tea. He is calm and practical. Sometimes you will feel he is lazy. so guys check which planet occupies your seventh house ? This description is very useful before getting married. To get married seventh house should be connected with Second house. Second house represents your Family. After marriage there will be addition of person in your family. So if Second house is connected then there will be Marriage Yog in your destiny. With Second house we should also consider Fifth House. In astrology,Fifth house is house of Pleasure,Romance and Progeny. After fifth, most important house is Eleventh house. Eleventh house is house of aspirations, gains,happiness through fulfillment of desires. So if this house is connected with Seventh house it gives confirmation about the event of marriage happening in one's life. I have come across some people who have decided not to get married. In their horoscope Seventh house is connected with Sixth House,Tenth house. These people are stuck with circumstances like ill health of parents or Job profile is more of travelling etc. Though in different community marriage age differs, its the destiny which decides date of marriage. If Saturn is aspecting to Seventh house or Seventh house Lord or Moon,marriage happens after the age of 30. To get married in proper age one should have supportive Dasha as well. This is frequently asked question. Now a days people are more inclined to select their partner of their own. As they are not much ready to tackle with the problems which are faced in arrange marriage like - marrying to unknown person, family is unknown. There are chances that past events or any illness to the person has not been disclosed. Now a days though love marriages are common in different castes, people still are reserved about getting married into different religion. So to calculate this from your Horoscope,is not an easy task for an Astrologer. 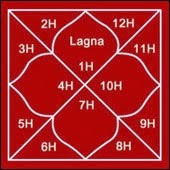 Seventh house connected with Fifth and Eighth house indicates Love Marriage. If Planets like Rahu is connected with Seventh house,marriage in different community is quite possible. But here too dasha should support for this Inter Caste or Inter Religion marriage. How will be married life ? Is there divorce written in my destiny ? This question is usually asked to astrologers. Previously in our culture being a divorcee was not taken positively. Being divorcee and getting married for second time is now frequent and is getting slowly accepted. If Seventh house is connected with Sixth house or Tenth house then there will constant conflicts between couple which will lead to divorce. Seventh House connected with Jupiter or Mercury results in second Marriage. Even if Seven house is presented by dual sign like Pieces,Gemini,Sagittarius or Virgo divorce is possible. So if you have dual sign in your seventh house be careful while selecting Life Partner. Through horoscope we can get details about life partner,Marriage, Married Life,Nature And Description of Partner. We can surely use Astrology as a tool to guide us. वास्तूशास्त्राप्रमाणे कशी असावी तुमची बेडरूम ?